At least with Lionel Messi and Cristiano Ronaldo, the things they do can’t be replicated. Messi’s less a soccer player, and more an extraterrestrial sprite, gliding in and out of different dimensions, scoring goals just to show humans how inadequate we really are. Ronaldo’s a fully groomed Zeus-tank who explodes the sport just to show how dumb the game really is — and so he has an excuse to flex a single thigh muscle. Everything Arturo Vidal does, though, can be done just as well by someone else. Except, well, all of it. Tactics expert Michael Cox recently called Vidal “the world’s best footballer,” as another way of saying that the 26-year-old midfielder does everything other than put on a pair of keeper gloves. As soccer has moved toward complete players who can fit in anywhere, and away from anyone who’s played for Tony Pulis, Vidal has most embodied and accelerated the trend. Since moving to Juventus from Bayer Leverkusen in the summer of 2011, Vidal has won two Scudettos, scored 25 goals, and assisted on 15. He led Juve in goals (10) and assists (eight) last season, and he’s on pace to surpass both of those totals this season, with eight goals and four assists in less than half a year. And yet, despite playing for the best team in Italy, he’s been in the top five of tackles per game in all three of his seasons in Serie A.
Oh, and about that team: With 16 wins, a loss, and a draw through 18 games, it’s on pace to set the record for the most points in a Serie A season. All of which was confirmed yesterday with a 3-0 win over Roma, who were undefeated and in second place before the match. Vidal’s 17th-minute goal was a nice snapshot of his all-everything-ness: cutting in from the wing, outside to inside, with a long run, angled just right to stay onside, capped off by a calmly placed, inside-of-the-foot finish. Players like Vidal, in any sport, often get stuck with the “jack-of-all-trades, master of none” label. Yeah, but what is he great at? Except, with Vidal, it’s more master of all, and who is this Jack guy? He runs as much and as hard as anyone — he’s literally that dude in preseason who keeps running when he’s already done, yelling at everyone to keep going — and he leads his team in assists. He wins more tackles than Nigel de Jong, and he scores more goals than Mario Balotelli. He plays as an attacking midfielder for Chile and an emergency center back for Juve. 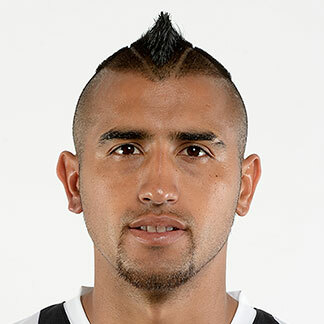 Vidal’s so fine-tuned and efficient that his (phenomenal) haircut probably turns him into some kind of aerodynamic human shark. None of this is new or sudden, just consistent, progressing greatness. He almost signed with Bayern Munich in 2011, which really would’ve been unfair. Every team in Europe wants their own Vidal, and Juventus just re-signed him through 2017. (Although this ranking from the Guardian — he’s 26th — suggests he’s still undervalued.) But with Juve eliminated from the Champions League (where Vidal scored five goals in six games) and looking like they’ll skip to another title, his name will probably remain unknown to most people who live in the country that shows Serie A on beIN Sport. And even at the World Cup, Chile will face the toughest two-team draw in the tournament, so that might be a quick blip, too. Consider this your first Arturo Vidal PSA, then: If you like soccer, he does it better than anyone.